Once again we find ourselves at the start of a brand new month. As we've focussed most of our attention improving the performance of Coassemble we've had just a few new features released in the month of April. We've added an additional 'must complete by' option to group settings. You can now choose to have your participants complete their course within a number of days from either enrolment, or commencement. Date enrolled is useful if I gradually want to enrol users over time. I may just use 1 group over a number of years and each time I enrol a new participant they get X number of days from the day I enrolled them. Date commenced is useful for when I want to give my participants the flexibility to choose a date they want to start their course but make it fair so that all participants get the same amount of time to complete it. You can also combine the two - for example, you can make sure participants complete their course within 60 days of enrolment and within 5 days of commencement. 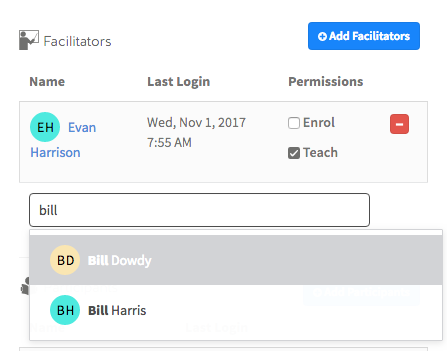 You can now quickly add new enrolments by typing straight under your list of facilitators and participants, making it quicker than ever to enrol members into your courses. We've updated the Quiz Report export to include all of the detail and attempts for each participant.